English Welsh and Scottish Railway (EWS) has said that Germany's Deutsche Bahn is close to announcing plans to buy the British freight operator. The value of the planned purchase has not been disclosed, but there have been reports that EWS could be sold for as much as £250m (371m euros). EWS said more details of the tie-up would be revealed at a press conference in Frankfurt on Thursday. A merger would allow Deutsche Bahn to expand its European freight business. The volume of goods carried by rail in the UK has grown by 60% in the past 11 years. "The announcement will mark the conclusion of talks between Deutsche Bahn and EWS about developing a stronger European rail freight network," EWS said in a statement. "The acquisition will help Deutsche Bahn and EWS increase the amount of rail freight hauled in Britain and mainland Europe," the firm added. EWS said it also expected that Deutsche Bahn will announce on Thursday the purchase of a stake in Spain's Transfesa, a Spanish road and rail logistics provider specialising in transporting cars. The state-owned German rail giant's drive for international growth comes as the final details of its partial privatisation are hammered out with the government. 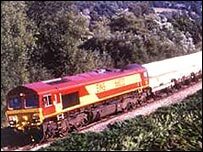 EWS, which is based in Doncaster and employs 5,000 people, took over British Rail's rail freight business in 1996. It controls two-thirds of the cargo sent by train in the UK and has an annual turnover of £500m. It operates more than 1,000 freight trains a day across Britain and into continental Europe through the Channel Tunnel, recently expanding into France with a rail freight company called Euro Cargo Rail. Earlier this year, drivers of the firm's Class 66 locomotive, which form the backbone of its fleet, threatened to boycott the trains over "unsafe and unhealthy" condition.